Although I sincerely intended to close last years cruising season by publishing a final blog, I didn’t. So here is catching up. 448 times that an artefact had to be serviced, of which 297 locks, the rest were bridges. After leaving Antwerp harbour, where we had the bow thruster repaired, we went back to Amersfoort by way of the Belgian Kempen, Zuid-Willemsvaart and the Merwede Canal, the ever beautiful Koninginnenlock and the river Vecht. 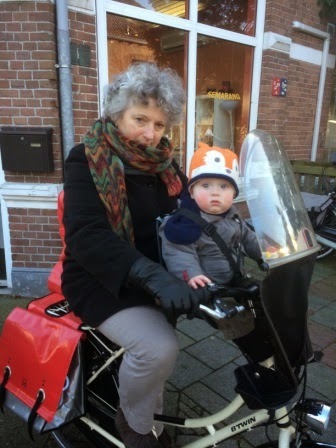 We lived, for years, near the Vecht and made many a bicycle ride along its banks, but experiencing it from the water is different. Especially with a big barge like ours it’s quite an experience, as the Vecht is better suited to smaller boats, but it can be done and is quite fun. Cruising the Eem we suddenly realised that sanding is not allowed in Amersfoort harbour and there were a few patches to be treated before winter. So, whilst cruising, I quickly did all sanding and, once moored, we could treat the patches. And then we were back in Amersfoort and of course we met up again with friends and family, always one of winters treats. 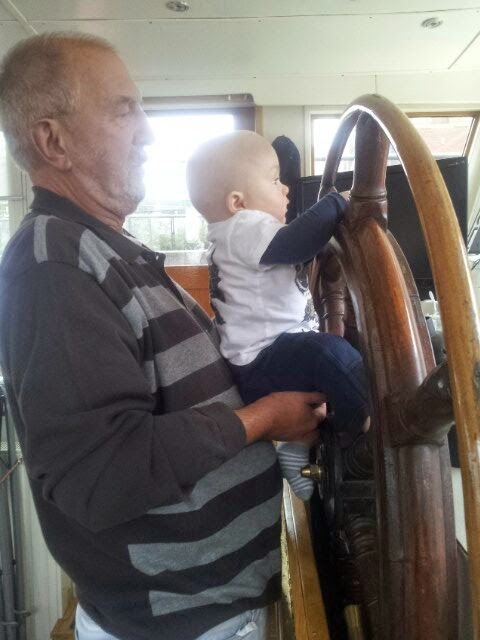 This time it comprised also seeing our grandchild, who had to be immersed in the art of steering, never to young to start. In November we went on a holiday to Spain, where we enjoyed the weather, the scenery, more family and of course al the wonderful food. 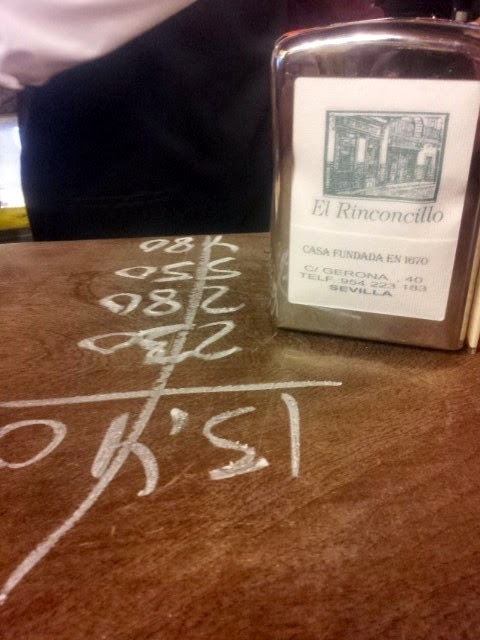 We especially frequented the tapas bars. Winter in Amersfoort was a bit unsettling as the river had to be dredged and several ships had to move several times to different locations. But this winter we also enjoyed Nathans weekly stay over’s and our new roles as grandparents. All clichés are true, like you have all benefits and no disadvantages, you can spend more time and have more patience etc. and, oh boy, how nice it is to have a manikin in your house every week and he does grow fast! One morning in January I sleepily went into the kitchen and was surprised to find that drawers and doors kept opening. I took me some time to realise that something funny went on and then I was wide awake instantly. The ship was askew, and quite a bit too. I alarmed Michel who came out of bed and immediately went out to look. I opened hatches to check for water. Michel then entered smiling, stating that we had gotten stuck on a bollard. The water levels of the Eem rise and fall quickly, we know that and take it into account when mooring. It never happened in previous years and we don’t know why it happened now. Never the less, we were tilted and moving 70 tons sideways by hand, no way. We, for a moment, considered asking the guys who repaired the street to use their shovel but decided against it for fear of damage. And then Michel thought (it was still early morning for us) that the simplest solution would be to start our engine, rev it up – the lines would keep us in place – which would push us up and side ways. Worked just fine. And then it was March, more nice days with rising temperatures. That causes the itch and so it’s time to remove the curtains that keep us warm in the pilot house, to put the stools back, to buy new plants for the deck and to start making plans. 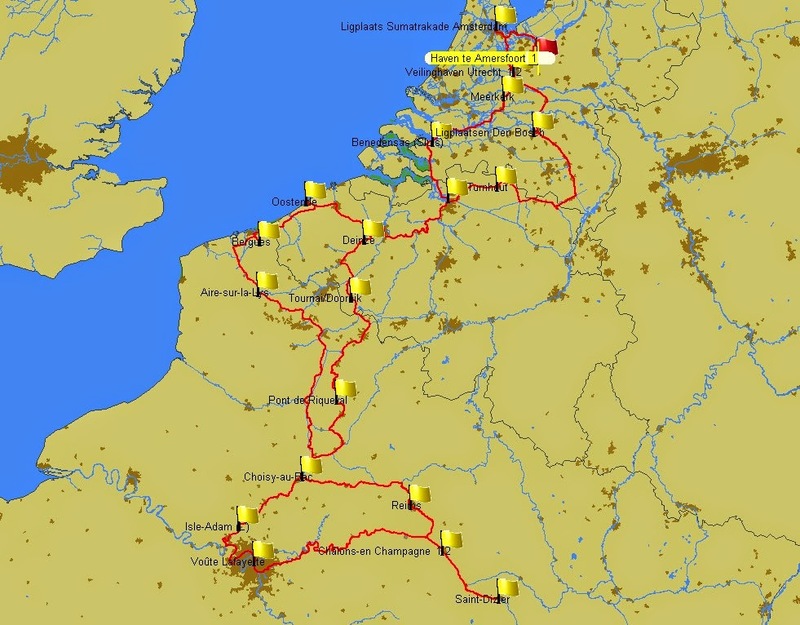 We planned a trip that will bring us, via Belgium and Paris, along (not on) the Loire river to mid France. 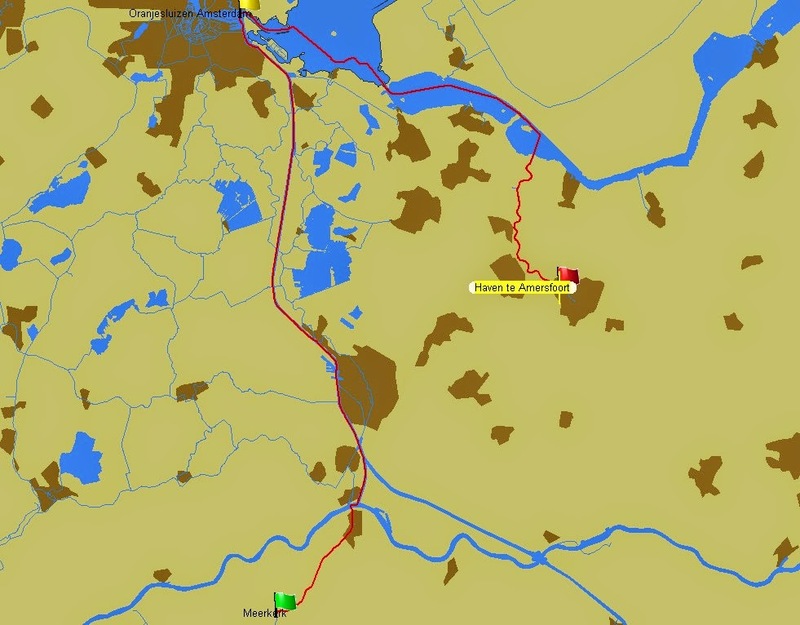 Then, more easterly, we go North and then go back to Holland by way of the Meuse river. So we started off and immediately started with bad luck. Let’s hope this will be all for this year. According to plan we left Amersfoort on Wednesday, 25th in the afternoon planning a two hour trip as far as the Randmeren. Then an early start next morning in order to reach Muiden before ten, then on to Weesp and then onwards. Because of the weather predictions – hard winds – only Thursday morning was right to cross the Randmeren; when the wind is too strong all our furniture and such is at risk because of the waves. After mooring on day one it appeared that we couldn’t start the engine. A bit of research led to the conclusion that the batteries had died. If only it had happened earlier that day on the try runs or even earlier that winter when we had moved, but no, it had to be on a spot far removed from everyone and everything. To make matters worse, the battery that starts the genny had died on us too. So we were facing loneliness, no heating and no light, awful. All batteries were 7 years old, with a life expectancy of 5, so small wonder; but what timing!! 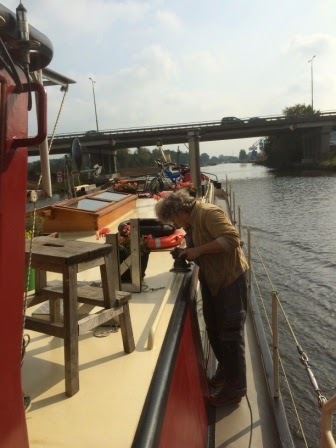 Fortunately, we had, through our neighbours in Amersfoort, met a ships mechanic and we called him right away. The man is a life saver. Thursday morning his wife came along with a battery to start the genny and in the afternoon the new batteries for the main engine were installed. We did have to tow the boat about 100 meters, the good old fashioned way, so the batteries could be put on board. It was quite a challenge, pulling 70 tons, in the rain, wind in your face (thankfully in the right direction) the way they used to in times past. Then we were up and running, and was the waiting for the wind to lessen to continue our trip. Weather predictions showed that Saturday morning, 28th would be the only period when the wind would be less than 5 Bft, so it was either then or wait for another week. Although we’re not early risers by choice we had quickly made the decision and at 6:30 we set sail. By then it was weekend when lots of bridges are not operated and because of that and of an out of order lock we had to reschedule our route. Eventually we cruised until 16:30 and then found ourselves in Meerkerk. Now and the days ahead there will be strong winds, crests on the waves in the Merwedecanal and heavy rains, so we stay put. We still have lots of chores.